The little form factor radio with a classic display and GREAT performance. This radio was purchased used some years ago and has been at the BOL as a spare radio. It is 100 watts with 160 thru 6 meters ( with60 meters and Alaska Emergency channels in MEMORY)with DSP,auto antenna tuner and ATAS 120 screwdriver tuner controls also. I tried this on a whim on the 51 foot ZIPP-ZEPP antenna and the 3 to 1 internal tuner TUNED ALL BANDS to below 1.5 to 1 SWR and I found the DIGITAL VOX allowed a simple audio cable interface to operate with FLDigi and do many sound card digital modes. Multiple programmable buttons allow user to bring most used menu items to the surface and the METER allows SWR,POWER,and ALC to be easily swapped on the large,easy to read 'reversed' LCD display. This is a little radio that can as it handled everything I tried well and even PSK ran fine at 35 watts ,which is above the AM and FM rated 25 watts of the little radio without the cooling fan running above the low speed...high temps activate the hi speed as needed and the 450D did not break a sweat. This radio can be had at well below it's retail price as it is an older model that deserves a look. Priced at $779 and FREE shipping at R and L electronics. AFTER returning home from field day I setup this rig outside along with a vertical whip attached to a Wolf River Coil. I threw out my call when they asked for checkins. I got a 5-4. So I was weak, but readable. After the check-in a station in upstate New York made contact with me. He gave me a 5-7. That may have been my furthest 40m SSB QSO. He sounded great to my ears, and I only had to repeat a few things. I'm still coming to learn the DSP options, but already have successfully used the notch, DNR and width filters. When working digital like PSK31, narrowing the width REALLY cleans things up on the waterfall. For modes that have fixed frequency locations like 14.070 this works fine. Just make sure if you are "chasing" around the band, to widen the filter, else you can easily tune past without hearing. Also, for QRM rich environments, the notch and contour can surgically avoid annoying hum and whistling noises once you identify where in the frequency they are relative to your dial frequency. Smurf is a lucky guy because the radio he has was the radio I had and it is available at a bargain price from many sellers even now . The ft450 is a notch above the average 'starter rig' and is a very capable and easy to use ...small footprint radio. The ft450 is a notch above the average 'starter rig' and is a very capable and easy to use ...small footprint radio. In four years' use it has performed well, and lived up to all the reasons I bought it for in the first place. The IF DSP is vastly superior to any of the AF stage DSPs I've had a chance to play with. The main broadband noise reduction is good, without the "burble" sound frequently heard in AF stage DSPs, and the manual notch filter is great at slicing out an overbearing signal when working PSK. Two handy things I've discovered recently are that the "DSP/SEL" knob can be re-programmed to adjust the RF output power (shoulda been there all along, not buried in a menu! ), and that the "C.S." button can be re-programmed to send a 10w carrier to aid in tuning. Took me a while to learn these, because the 450D's so jam-packed with features. Congratulations Smurf, on the new radio. I'm sure it'll be as at home with you as it was with Carl. Maybe Carl customized it already, but on my unit if I tap the DSP button until NO DSP option is selected, that's what the DSP/SEL knob does. The SWR meter is still weird to me. I figured out the CS trick with the CW tone. In that circumstance I do see the SWR, but I would expect any time I'm transmitting (with CW carrier, FM, or yelling loud on SSB) that the SWR meter would wiggle a bit. I should re-read that manual section. Overall this rig gave me a lot of capability I did not have before. I had it set to adjust power also..and the meter button selects the SWR metering that meters between the radio and internal tuner and measures AVERAGE SWR so if it goes above 1.7 to 1.8 ,the tuner will automatically adjust.That tuner can adjust a lot more than some tuners I have seen lately on other radios. Push and HOLD DOWN the DSP/SEL knob for a sec or two and RF POWER adjustment should appear. It does, and when operating digital modes like PSK, I got accustomed to adjusting RF power during transmit. Audio levels, RF power are all factors for a good signal, so being able to adjust the knob on the fly is useful to me. Over a year later going to poke this topic again. The radio looks good; wondering if the Yaesu FT-DX1200 is a major bump, not that big, or am I looking at apples and oranges. I am looking at picking up something that would be a step up or so from a starter rig. I have all of my 3 tickets so my options are open. What do I plan on doing with it? Play with it when I am board, as a possible communication device on the local repeater network. Find a number station and see how well they can count. 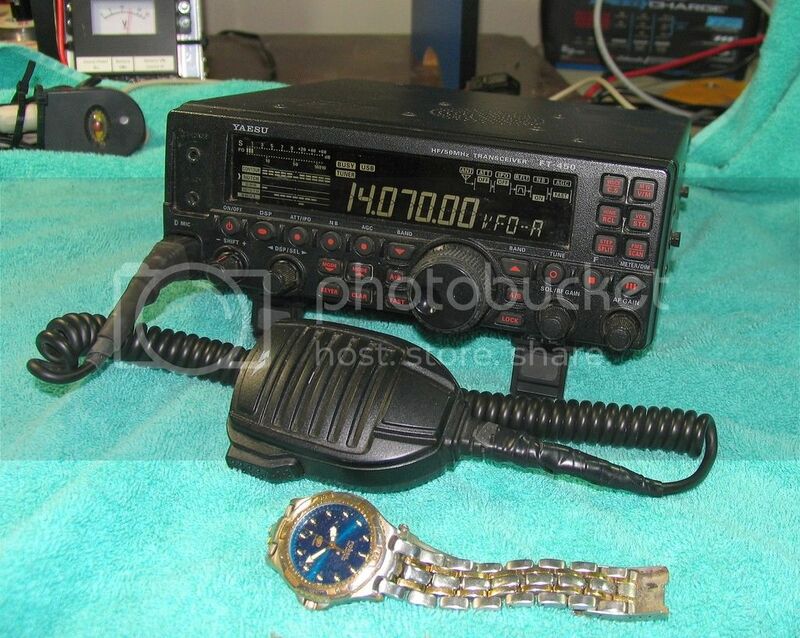 I have little time with a 1200 and do feel the FT450D with it's digital signal processing in the IF is a somewhat better radio than the 1200....That said ,for the money ....the better radio is an ICOM 7100 for a great all band all mode (with D STAR option) that is a favorite ,with it's great receiver and touch screen controls. With a bit of humor here; you are trying to say - get the Icom IC-7300, right? I have a friend with one, it's pretty nice. In a few hours of running it, here're a few things I've noticed. It's freekin' big, like twice the bulk of a 450, and weights 20+ lbs. It's too much for a car camping trip, more of a shack queen rig. Bug-out bag? Fugettaboutit. The main RF parts are big, heavy, analog RF circuits. It's a triple conversion receiver that shrugs off interference. Lightning crashes and nearby stations aren't a problem. It won't overload like some of the SDRs will. The DSP filters are easy and useful on digital modes. Narrow, wide, notch, etc., you can slice and shift out the signals you don't want to pass to the computer. The DNR is effective and has like 10 levels. I think the DSP & DNR are in the last IF; check me on that Carl. It's the replacement for the 950, I think that was last of the old AF stuff. Tons of menus. Everything is adjustable, maybe too much so. The scope function is fun, but maybe not that practical without the FFT board. Kind of nice for shortwave listening though. The big display is pretty nice, you can keep track of lots more things than on a 450. My buddy found his lightly used in the mid-$800's, but I've seen them new in the mid-$900's. In some ways it's a major bump from the 450, at the cost of portability. At this price it's probably worth the step up if you don't plan on hauling it around much. Small and portable is not a requirement - Shack queen is fine, as long as the queen gets some good work out. Part of me is thinking I should just invest in a Software Defined Radio to play with on a Computer. Most of the current Ham transceivers in manufacture today are CPU driven and I feel are not as 'refined' in the quality of audio as the older radios and actually lack a quality that I have found important ,to me. I currently have an embarrassing number of HF Ham radios even after giving an older Icom IC737 to Jeff,a good friend and my current 'antenna buddy,who builds and helps test the antennas that I dream up.If you are not an active user of radio,perhaps a good USED radio would be a better choice until you come up with the criteria you find important in a radio as they are a costly investment even though the ICOM 7100 is a fine radio at under $825. I understand your point Carl and agree with them. You start at a specific price point and see what you can see. Then you say, self, but for a few dollars more I can get that feature or that. And the next then you know you are looking at the bejeweled version of some hardware that has too many digits. However, sometimes you can add 10% more money to hit the price / performance sweet spot. I don't have the eye or skill to determine if a used item would work, or fix the problems said equipment might have. My soldering skills are poor at best. Some of the kits I have referenced are on sale, and are not that much higher in price. I have seen some of the reviews of the ICOM 7100 and it is a fine radio. Always happy to share time with a friend. Another consequence of the modern CPU based transceivers is serviceability. Last year I had the CPU fail on my FT-450 that I coincidentally traded from Carl. Certainly not any fault of Carl's. Yaesu ended up replacing the entire main PCB. Cost me around $250. I was a bit annoyed, but I could not buy half that radio for the price of repair. I'm hopeful that means I have a mostly new transceiver. Though if Yaesu ever ends support for that model and the replacement microprocessor boards aren't supplied, it couldn't realistically be repaired compared to many vintage models. Though this is the way of most consumer electronics, so it shouldn't sway your choice of radio too much.